As a result of the Energy Compliance March 22, 2012, GEUS was tasked with preparing a web-based GIS portal for geological data relevant to deep geothermal energy. The purpose was to make quality assured data interpretations and data assemblies readily available to stakeholders in the geothermal industry and the authorities, and to ensure the best possible geological basis for geothermal decisions. The portal presents a number of geological maps, which give an overview of the nature of the subsurface, geological uncertainties and the density and quality of the geological data based on e.g. 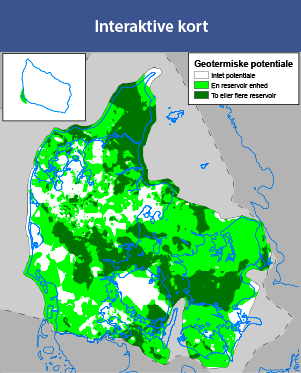 results from a comprehensive research project conducted under the auspices of the Danish Council for Strategic Research (read more under “DSF-Geotermi: Background“). In addition, Ea Energianalyse, COWI, the Dansk Fjernvarmes Geotermiselskab (DFG) and GEUS conducted an assessment for the Danish Energy Agency of the potential for production and integration of geothermal district heating in 28 selected urban areas. Results from this analysis is also included as part of the WebGIS portal. As part of the presentation of the WebGIS portal, a major meeting and seminar was held on May 12, 2016, at GEUS, where among others the Ministry of Energy, Supply and Climate Affairs participated.